Even as a child I was mesmerised by the colours and gracefulness of the Dragonfly. However I didn’t know much about her on a spiritual level, until a few years ago, when I have already consciously been walking my spiritual path. At that point I was standing at crossroads, completely stuck, unable to decide what to do in my private life and I was searching for outside help. I was told by a psychic that the dragonfly spirit animal is working with me, helping me through some big shifts and changes to see the world around me less seriously and assisting me to bring more joy into my daily life. So I started working with the dragonfly in the only way I could imagine, creating a painting with her, which I called Road to Enlightenment. I am an energy artist. 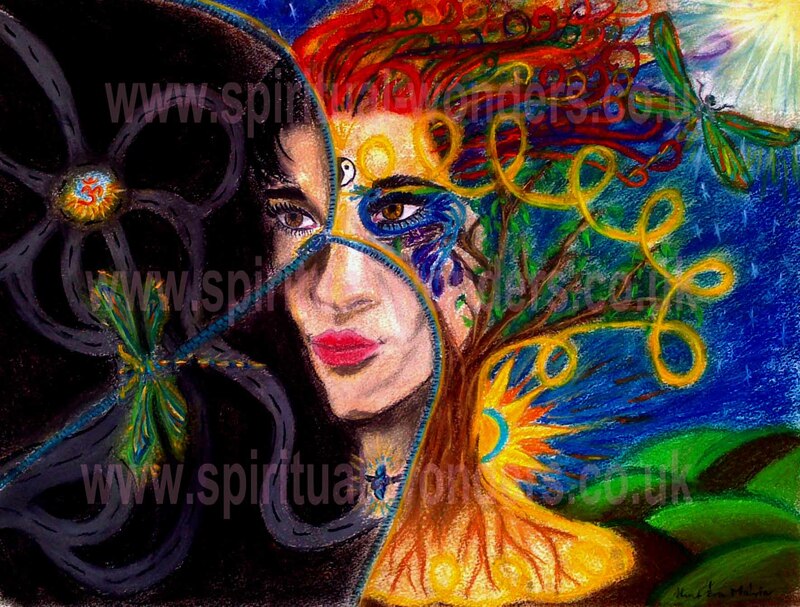 I see the spiritual world in colours and pictures, so I often channel messages through paintings for myself and others. This particular painting says it all, encouraging us to see ourselves as we really are, the beautiful, magical, amazing beings, who are wearing masks, pretending we do not know the truth about ourselves. And it’s true, on some levels, we don’t consciously know who we are, until we dig deeper, listen to our inner voice, higher self or soul and then we have a sense, a feeling of being so much more than we think we are. So I worked with this painting, meditated on it, and was open to receive guidance from above. After this work I made some changes and my life was changing for the better. Totem is a natural object or animal, a spirit being, a symbol of a clan, family or individual. The dragonfly as a totem is associated with the light. It is encouraging you to show your true colours. She usually appears in your life, when you need to look through illusion, deception and find clarity inside and around you. We are souls, spirit in a human body, and we have a team of helpers working with us, helping us on our path. They are always there, at least some of them, even if we consciously are not aware of them. Some spirit guides appear in a shape of an animal, and their qualities are usually the ones we also possess or thriving towards. In this case gliding with easy, being light, flying towards the light, etc. In childhood we are learning about ourselves and the world around us and creating strategies that help us survive. These strategies serve us for a while then they can turn against us. The dragonfly as a spirit animal reminds you that you are a master of illusion. You can adapt to almost any situation and you are a survivor. You wear masks for others to please them, to give them what they are after: love, recognition, etc. These masks served you really well as a child, but now you are an adult, you are the master of your own life, so you can stand up for yourself, show your true values and manifest your own desires. How do you receive the clues? And what do they mean? After a while I forgot about the dragonfly. Until a few days ago, when I was sitting in the garden watching the birds bathing in our pond and a gorgeous dragonfly appeared with amazing dark Blue wings on the rock near me. I thought how beautiful she is and what an honour it was seeing her for a few minutes… The following day I have received a Turquoise greeting card from an amazing lady with a Silver Dragonfly printed on it. I thought how nice and what a coincidence, but I still didn’t think much of it. However the day after, I have been doing some work on myself, trying to cleanse some energy between me and people, who were draining me energetically and when I finished it, I was reminded by another psychic reader, Teri Uktena this time, through one of her newsletter, to wrap protective Turquoise crystals around my left wrist and if possible wear my spirit animal for extra protection. Finally I got it. 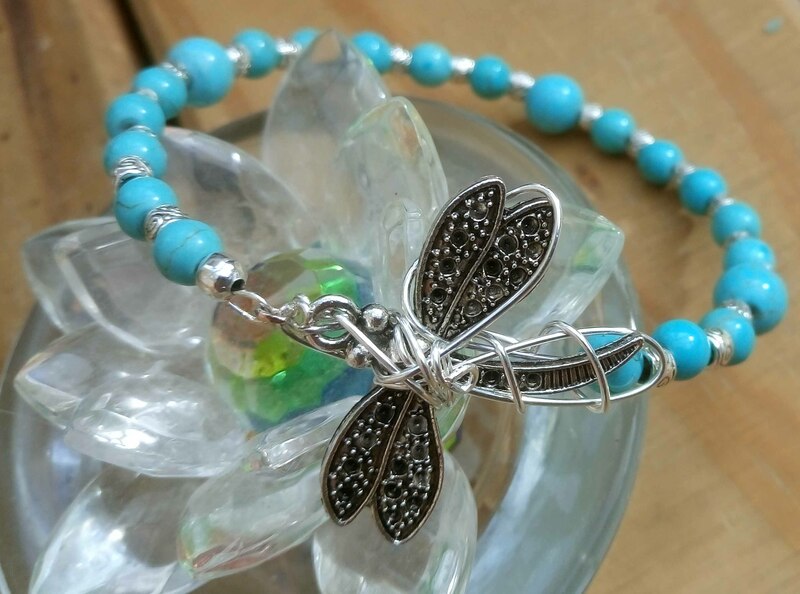 Blue Dragonfly on the rock, Silver Dragonfly on a Turquoise card, then animal spirit with Turquoise healing crystal… The penny has dropped and I felt the need straight away to search for a dragonfly charm, so I could make a bracelet for myself incorporating it with Turquoise gemstone beads and started wearing it straight away. It gives me so much courage and the feeling of protection, which is partially coming from the connection to my spirit animal and partially from the protective energies of the Turquoise healing crystal. 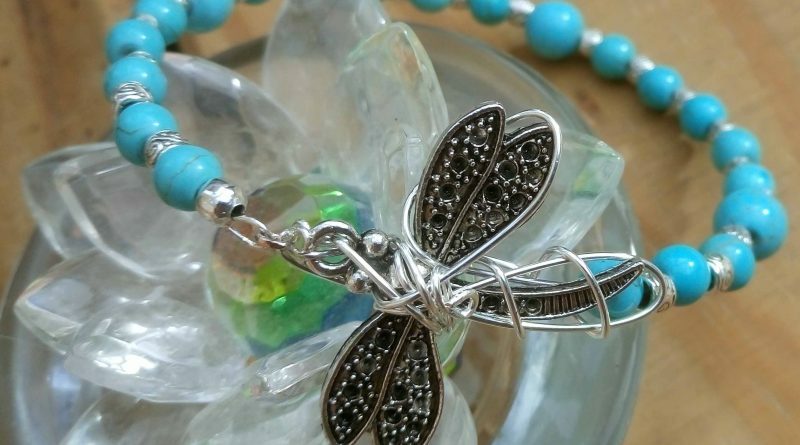 Do you love dragonflies? Are they appearing in your life frequently on a card, in nature or symbolically? If you have them appearing for you, just think about what they symbolise and what is the meaning of their appearance. They can help you enormously.